Sure, leadership books are great and all, but they never really get into the nitty-gritty - like when rats are falling from the rafters of your warehouse, or the zoning board is putting a drag on your building project, or your homemade rocket launcher doesn't fire as far as you expected it to. 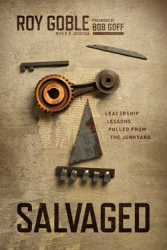 Salvaged: Leadership Lessons from the Junkyard never deals in abstractions, whether from the analytics or from the sacred Scriptures. You'll laugh, you' ll think, and you might even pray to make better decisions, persevere through bigger challenges, and be a better leader for your people.